Getting a satisfying “this is great!,” followed by “write down what you did and don’t change a thing,” (albeit from a rousing gallery of one) kind of solidifies that this particular plating will be a favorite in our nest for some time to come. While I’d love to take all the credit for this dish, its inspiration comes from a recent night out. Reading recipes and trying new dishes at restaurants often serves to inspire the twists and turns I might take with a favored ingredient and a tried and true approach. This particular dish is a perfect example of doing just that... playing off the components of a salad enjoyed with our Seattleite daughter at Bar Cotto, one eatery among the several in Ethan Stowell’s culinary ménage; this one in Capitol Hill. I happen to love farro for its nutty flavor and pleasing bite. (Plus it’s incredibly agreeable to a variety of flavors so it plates really nicely with a host of different characters.) While I traditionally take it down a more savory path, its pairing with acorn squash on the Bar Cotto menu was the selling point for our daughter… and it did not disappoint. As such, I committed the key ingredients… farro, acorn squash, green apple and pecans… to memory knowing that this dish would likely become a keeper. 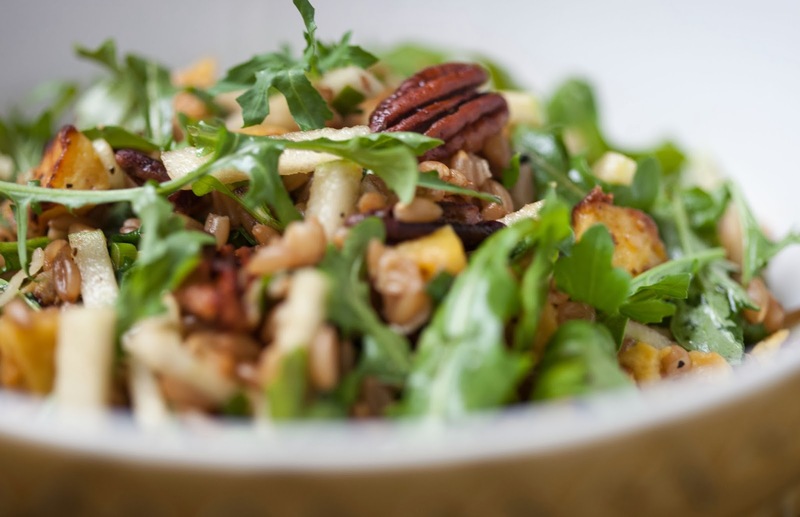 My version includes arugula as I think this nutty little green gives a welcoming freshness to the warm and comforting notes that stand out in this salad. And, if you’re thinking of this as a main course option, I think the arugula lends a more developed composition. The acorn squash, roasted in my version, is subtly sweet. 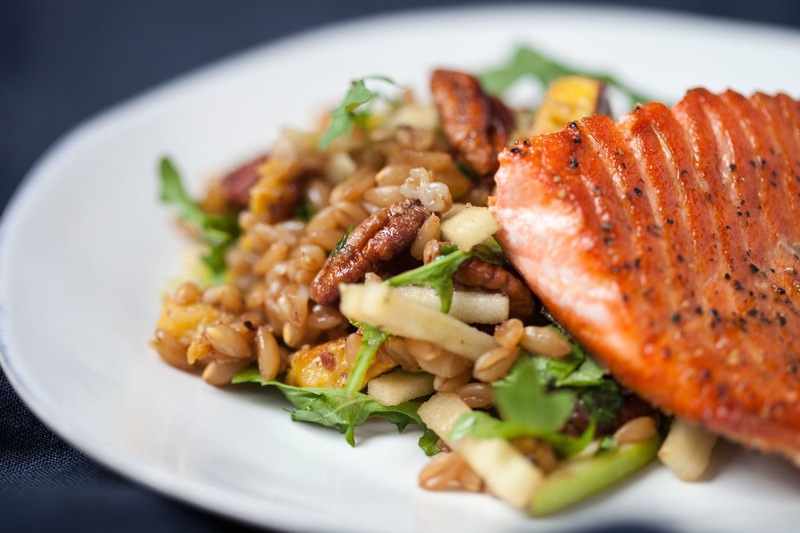 And… when mixed with still-warm farro it beautifully softens, lacing a whisper of sweet flavor throughout the salad. This subtle sweetness is more than pleasingly enhanced by a generous sprinkle of sugar-maple pecan halves and an awakening pop of sliced green onion… a needed bite of yang to this salad’s comforting yen. And then, of course, there’s the fresh apple… a bright Granny Smith in my take. 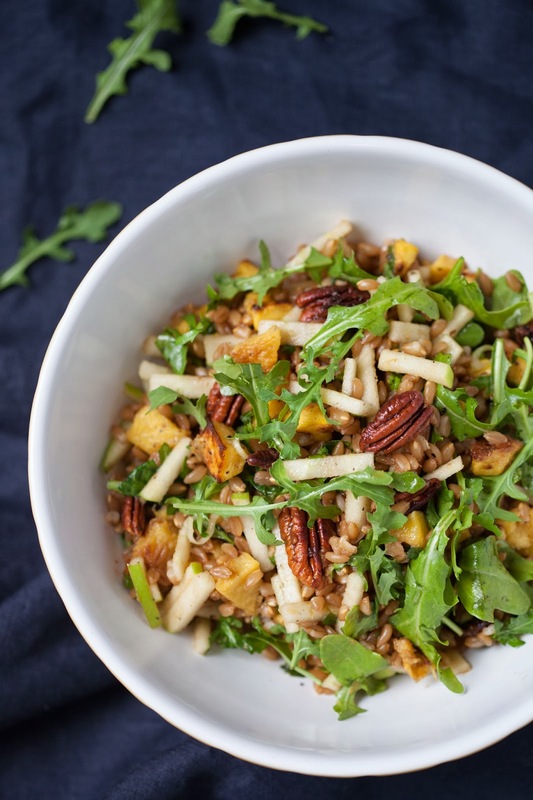 Bits of little matchstick cuts of apple lend a crisp, fresh component that marches along the same brightening path as the arugula and green onion in balancing the more subtle tones of the farro and squash. I truly don’t remember if there was a dressing on the Bar Cotto version but upon tasting my own rendition I believed it needed just a tad and the orange-maple-balsamic vinaigrette I whisked together does it perfect justice. Though I don’t pretend to be well versed in vegan fare, I believe that with attentive sourcing (pure maple syrup and brown sugar that’s not laced with lard… surprising, but apparently possible), it would be a great vegan option. In this particular plating, we coupled it with a simply sautéed salmon. So good! I won’t change a thing. Preheat oven to 400 degrees F. Place diced squash on baking sheet. Drizzle with 1 teaspoon of olive oil and ¼ teaspoon each of salt and pepper. Toss gently to combine and arrange in one layer. Roast in oven for 15 to 20 minutes, until just golden and soft to the bite. Meanwhile, cook farro in water and a little salt (according to package directions), until al dente. Drain, cover and set aside. In a bowl, combine roasted acorn squash with farro while still warm. Add green onion. Place cut apple in a small bowl and toss with 1 tablespoon of orange juice, to coat, before adding to farro mixture. In a small bowl, combine brown sugar and maple syrup. Add pecans to bowl and stir to fully coat. Place pecans on a baking sheet and roast in oven for just a few minutes. Watch them closely!!! They will burn very quickly. Add roasted nuts (as much or as little as you’d like) to farro mixture. Add arugula to farro and toss gently to mix through. In a bowl, whisk remaining tablespoon of orange juice, balsamic vinegar, maple syrup and remaining teaspoon of olive oil. Add a pinch of salt, to taste. Add dressing to farro salad; toss to fully incorporate and serve immediately. * about ¾ cup dry farro will yield about 1 ½ cups cooked; do not soak farro first (I think you lose some of its great bite if you do). **For this preparation, the easiest way to remove peel from acorn squash is to first cut off both the stem top and bottom end of squash, then cut squash in half lengthwise. Using a teaspoon, remove and discard seeds. Then lay halves, cut side down, on a cutting board and slice crosswise into approximate 3/8” to ½” slices. Trim peel from each slice by laying slice on its side and cutting around edge to remove peel. Then dice into approximate 3/8" to 1/2" cubes. Repeat with remaining slices.